It’s well-known that Ernst Lubitsch had an autocratic way with actors, modelling gestures for them in order to get the precise timing and physical articulation of emotions. An interesting approach to cinema, almost singular, and it’s certain that it grew out of Lubitsch’s experience as a theatrically trained actor (it’s an approach that I associate almost exclusively with vaudeville-based “actor/auteurs” from the early sound era, who either took over the movie, like Fields, or mesmerized their directors through sheer magnetism, like Cagney or Grant). Most great filmmakers articulate emotions differently: through rhythm (Ozu, Bresson), the unfolding of time (Tarkovsky, Mizoguchi), or through the dynamic possibilities of cutting from one image to another (Hitchcock, Powell, Scorsese). But in a few rare cases, the filmmaker relishes the spontaneity of the actor and through sheer force of will harnesses it to a grand conception. Call this the “Shakespearean” approach to cinema, in which the finished product is a giddily fantastic array of gorgeous behaviors that feel varied enough to fill a whole universe, but that still manage to operate within a singular conception. Cassavetes is the obvious example. I would also add Maurice Pialat and Arnaud Desplechin to this lofty category. To me, Terence Davies’ approach in The House of Mirth (2000) feels quite close to Lubitsch. Not in the sense of “influence” – in all other ways, they seem worlds apart. Perhaps it’s more a matter of temperament than anything else: a compulsion to control, but also a passion to be one with the characters on screen, to be absolutely proximate with their emotions as they unfold across their faces and as they’re betrayed by their bodies. With Davies, the passion is all-consuming – none of Lubitsch’s urbane mastery here. And while Lubitsch concentrated on physical articulation, he was never as attentive to vocal articulation as Davies – precisely calibrated line readings, timbres and inflections, that give his Wharton adaptation a bracingly rarefied air, like the strains of a long-forgotten instrument played in perfect tune. And when this “absolute proximity,” to borrow a phrase from Calvino, crosses paths with authorial perspective, when Davies cuts or re-frames to get a moral perspective on his characters, the effect is stunning – even scalding. Davies also has something else that Lubitsch never had: painterly precision. This is not just a matter of knowing Singer-Sargent, whose work is evoked consistently throughout the movie (in fact, Gillian Anderson was cast in the lead because of her Singer-Sargent-like face: unbelievably, Davies had never seen The X-Files). It’s a matter of grounding every visual choice within both the visual style of the period as well as its monstrous etiquette. When Davies frames Mrs. Peniston (Eleanor Bron), Lily Bart’s aunt, in a bluish darkness, her face lit from below, or later places Lily’s cousin Grace (Jodhi May) in a similar light, rigidly pinned to the darkened background, the effect is to quadruple the sense of decorous claustrophobia, in which every word or move is nervously measured against 10 alternatives words or counter-moves, with the threat of social paralysis – either through the loss of leverage or through an excess of it – present at all times. Visual precision I had expected from the man who made The Neon Bible, but mobility I hadn’t. I’ve found his previous films impressive but at times uncomfortably adherent to the tableau form. Perhaps he’s still less at home with movement than he is with stillness. But if that’s so, then he’s found his ideal subject with this film about the vicious, hypocritical world of New York high society at the turn of the last century. When he gets into intimate situations, the movement of the actors is mesmerizing – even the slightest glance or shift in posture counts. There’s a passage in which Gillian Anderson’s Lily and Eric Stoltz’s Selden lie down on the grass and smoke a cigarette before slowly moving into a kiss. The actors are kept perfectly framed as their faces unite, their bodies craning to maintain a measure of propriety, the camera arcing slowly down as they sink into the briefest instant of romantic abandon. Throughout the film, the overall union of voice, physical movement and visual design is devastating: every note of humiliation, degradation and self-deception is struck perfectly but without romantic emphasis, in a horrifying sonata of redemption denied. What does Davies bring to Wharton’s novel? I grew up in Wharton country, and drove every day down the hill where the real Ethan Frome tried to sled into oblivion with his beloved. I’ve read most of her major novels save for this one, which many reliable sources tell me is her greatest. While it’s obviously the most Dreiserian of Wharton’s books, I’m sure that what intrigued Davies were the themes of redemption and suffering. It’s interesting that both The Age of Innocence (which Davies greatly admires) and The House of Mirth were made by Catholic artists consumed with the theme of spiritual suffering in a world that fails to recognize its viability. In both stories, the protagonists, both intelligent (maybe not enough, maybe a little too preciously so), are trapped in prison houses built from words, customs, prohibitions, the currency of a tortuous society they’re trying to manipulate, subvert or transcend, but with which they’re finally complicit. Both filmmakers employ horror film tactics at crucial moments (the darkened framing around Bron, the Godzillishly edited extension of Winona Ryder’s dress train as she gets up from her chair to deliver the final blow to Daniel Day-Lewis). And whereas Davies builds the horror right up to the final scene, Scorsese employs it sparingly, ending The Age of Innocence in a state of bitter resignation. Of course, there’s a crucial difference. Scorsese’s film is based on a book about a weak-willed man who finally won’t defy the world of which he’s a part, once he sees how high the odds are stacked against him. 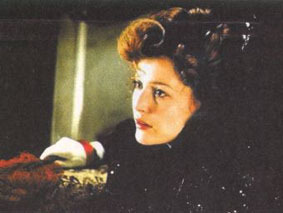 Whereas Davies’ film is based on a book about a woman who never has a chance, who tries to beat her hair-raising society at its own game: that is, to take it at its word morally, and offer herself as a beacon by accepting neither help nor love when it’s offered, never understanding that it’s all a sham until it’s too late. And Davies hits every note with hair-raising clarity: the flow of polite smiles, cunning sentences and gorgeous gestures, and the coded recognitions of nervous breaks in the rhythm (the pouring of tea is fraught with significance and danger); the humiliation that slowly spreads throughout Lily, like darkness falling over a city (registered in sharp, vivid, precise inflections – Davies and Anderson make quite an actor-director team); the strong sense of Lily as the magnetic centre by which everyone is attracted and repelled, heaping her with scorn and indifference as they go. Jim Hoberman got it right in his Village Voice review: this is a movie that merits comparison with The Magnificent Ambersons or The Life of Oharu, as opposed to Howard’s End or Enchanted April – in fact, it put me more in mind of Les Dames du Bois de Boulogne. The world is filled with people like Lily, banking everything on judgement day. In the Mood for Love goes down a similar road. But where Wong is delicate, Davies is ferocious. And where Wong’s story is about the retrieval of feelings lost in time, Davies’ film is a genuine tragedy about a life scattered to the four winds by an internalized ideal of goodness.